Is It Love or Charity? I believe that all faiths arise and endure because they have something to teach us. Today’s blog is the last of a three-part reflection on my own faith. If you come from a different religious tradition, please consider sharing what you’ve learned from your own faith in the Comments section at the end of today’s blog post. Everyone in my class received the palm-sized book, and Mrs. Fenny assured us that we would one day be able to read it. I already could. I had started learning the alphabet when my sister had entered first grade four years before I did, and my mom told me often that I could read by the time I turned three. That tiny New Testament was not my first encounter with the bible. Though my parents were not practicing Christians and never took us to church, my mom kept a leather-bound family bible on the top of a book shelf that held her most precious books—a set of World Book Encyclopedias and her Readers’ Digest Condensed Books. I remember struggling to lug that family bible from the top shelf so that I could look at the beautiful replicas of paintings of famous scenes from the Bible. Mom would see me and exclaim, “Estelene, be careful!” and come to my aid, pulling the book down for me and placing it on the coffee table, open to the pictures in the center of the book. 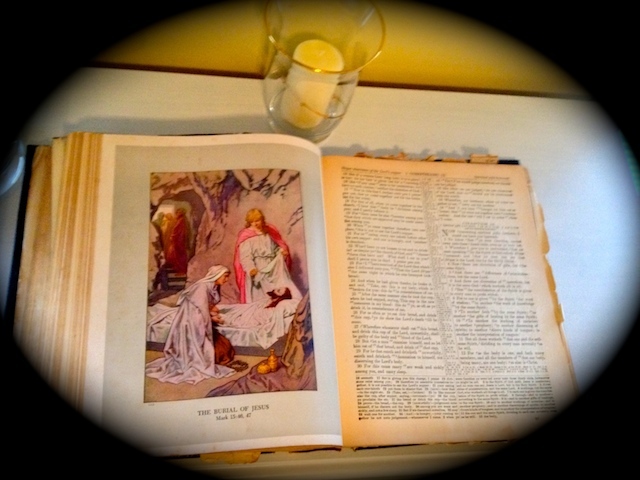 A few years ago, when my mother moved to a nursing home, she gave me the bible, knowing that I had read my favorite stories and verses many times during my childhood. The book remained one of her treasured possessions, even when the binding broke and the tissue thin pages started to come loose. Though I remember her making my brothers wash their hands before they looked at it, she never once refused us when we pulled it from the shelf. Her admonishment to be careful was, rather, a warning not to pull the heavy book down on our heads. By the time other versions of the bible that translated the word in this verse as love, I had long since thought of the verse in a very different context. My own family had received charity—in the form of food stamps and other help from the government—several times when my father was laid off after the owner closed a mine. The charity we received never came from the churches, since most everyone we knew was poor in those early years of my childhood, when my family lived in one of the counties recently affected by the chemical spill in southern West Virginia. Had the government not stepped in to fill the gap, many of us would have been starving and homeless, since we dwelled in houses owned by the coal companies. Because of my experience, I have always thought of the love in this chapter as a love for humanity—the kind of love that spurs us to give to people in need, to take care of the least among us. But I was a young adult before I studied the bible as literature and learned the context of Paul’s letter to the Corinthian church. The Greek city of Corinth had been destroyed by the Romans in 146 BCE and rebuilt about a hundred years later as a place for upper class Romans to send freed slaves and poor peasants—essentially a place to banish them from sight and thought. But the ancient city became a thriving metropolis, a center of trade. It was one of the first cities in what might be called Paul’s conversion tour. Like all major cities, Corinth eventually became a place where there was a vast divide between rich and poor. And as early Christians tried to figure out their place in the world, the church at Corinth, like many modern churches, argued about what should be their mission in the world. Paul’s first letter is filled with references to people who consider themselves wise and spiritual but who are overly concerned with their own wealth and pedigrees. And in trying to address all the conflicts, Paul steps into a mine field and gives advice that rankles us today because what he says about slavery and the role of women is so contradictory to the ideals Christ espoused. In fact, I’m guessing the women and slaves of his time wouldn’t have thought much of his advice either if they could have read it. And so, in an effort to avoid Paul’s more controversial comments, we lift this one beautiful chapter out of the context of the letter. The problem with looking at the chapter in isolation, though, is that we miss all the striking parallels to our own society. We, too, face a seemingly impossible divide between rich and poor. We Americans, too, become overly concerned with maintaining our wealth and forgetting that our nation began as a rag-tag collection of poor, huddled masses. And in trying to find our way as a church, we often step into a moral minefield that can distract us from our most important work. These verses leave little doubt about what our important work should be. The greatest work is love—charity and compassion for humanity. So tell me a story of the greatest kind of love. Previous PostWhat is Hope?Next PostHow Heavy is Your Backpack?